An Oligarchy of corporations and wealthy individuals created corruption in Congress. Sitting members of congress and incumbents are almost always reelected. “Unless the mass retains sufficient control over those entrusted with the powers of their government, these will be perverted to their own oppression, and to the perpetuation of wealth and power in the individuals and their families selected for the trust.” (Thomas Jefferson). Clearly, the Founders did not trust elected representatives not to abuse their office to pursue their personal wealth and repeated reelection. But the People have ignored our Founders’ wisdom. Consequently, our Democratic Republic is now a ruling Oligarchy of vastly wealthy individuals and their huge corporations, aided by hordes of lobbyists, non-profit fronts, dark money, and Oligarchs’ media. They use their wealth and resources to select and buy candidates’ loyalty, fund their campaigns, dictate their votes; creating intolerable systemic corruption, spreading big lie propaganda, causing lock-step dysfunction, waste the Nation’s physical and human resources, and ensure that their sitting members of congress are almost always reelected. Most Members of Congress represent the Oligarchs not the People. It has become a critical flaw in our Constitution. The U.S., not so long ago clearly the world leader, has fallen to 21st amongst nations, and is classified today as a flawed democracy. Among many analyses, a 10-min. video and a Senator’s eBook “Captured” explain what has gone wrong. Neither the Peoples’ Congressional choice from mostly preselected and bought candidates, nor choice of Party, nor choice of President, can reverse Oligarchs’ relentless capture of Congress, and with consent of the Senate, the Supreme Court. (“[You have] A Republic … if you can keep it.” (Benjamin Franklin). But the People have ignored our Founders’ wisdom; allowing all three branches of our government to become instruments of and for sale to political pressure and cash. The only remedy is for the People to retake some superior non-political federal power unto themselves. This website describes how it can be done if the People still care enough about their liberty; easier than we realize since 70% of of us can already vote on state and local initiatives on our federal ballots! Even the Oligarchy cannor bribe all the people (not yet anyway). A relatively simple solution is for the People to demand that Congress convene a Citizens’ Assembly to reinstall trust in the political process allowing citizens’ decision-making input on issues of great national importance. 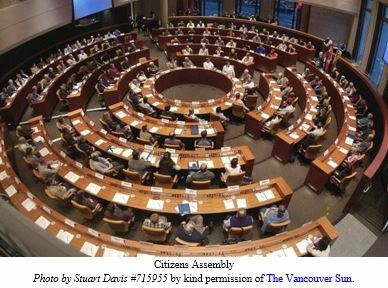 For example, Citizens’ Assemblies have been used in Canada and the Netherlands to recommend revision of the election systems, in Ireland to consider issues of population ageing, potentially to resolve Brexit, etc. These are worthy efforts, but use statistics companies to select Assembly members, are under Government’s control, and therefore attractive only as a first step towards an effective solution to Oligarchy. Our Founders anticipated today’s problem and included a far more powerful Constitutional solution. “We may safely rely on the disposition of the State legislatures to erect barriers against the encroachments of the national authority.” (Alexander Hamilton). The People have the power and the constitutional obligation to compel each State to take the necessary action. “Of the people, by the people, for the people” are not just pretty words, they are very real duties of every American citizen to defend their freedom, most critically against Oligarchic Government. To fix the flaw and constrain Oligarchy now and for the future, the People through their States must permit U.S. Initiatives on Federal election ballots under the U.S. Constitution, while retaining a republican form of Government. This can be accomplished constitutionally without support or approval from Congress! 34 States pass and then 38 States ratify the Initiatives Amendment by the 2nd Method. It authorizes groups of 25 or more U.S. Citizens to propose Direct Initiatives. A very large Grand Jury selects just the very best initiatives so as not to overload the voters. These Initiatives go on next Federal Election ballot for vote by the People. The basis of our political systems is the right of the people to make and to alter their constitutions of government.” (George Washington, 1796). “All power is originally in the People and should be exercised by them in person, if that could be done with convenience, or even with little difficulty.” (James Wilson). The availability of ballot initiatives in 24 States out of the 34 States needed to apply, and 38 States needed to ratify, a U.S. Constitutional Amendment, provides crucial power to bypass Congress. It permits concentration of the People’s resources to focus on convincing and/or forcing at least 14 of the 28 non-initiative States to submit their amendment applications. 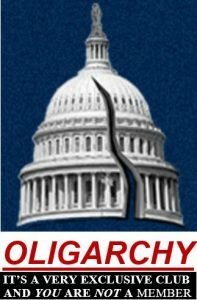 After the Amendment is ratified by a Limited Convention of the States, followed by a one-year implementation period, the People will have the direct power to limit Oligarchy. The practical details to achieve this are presented in this website. Central is a large Grand Jury assembly meeting one week each month, with rolling membership, that oversees the Initiatives system. It decides which few of the People’s Proposed Initiatives qualify to go on the Federal Election Ballot. (Though a Citizens’ Assembly is cheaper than a large Grand Jury, it would introduce opportunities for Oligarchic corruption). Today, Oligarchs can damage our Democracy far faster than the People can repair it. For example, Oligarchs and friends implemented Citizens United in 2010; but over 9 years later, even the most aggressive responses from the People are still in the early stages. However, once implemented, this single Initiatives Amendment enables consideration and prompt remedy of important and urgent issues within a few years after they arise, greatly reducing effort, cost, and dissention. Without U.S. Initiative power, the People procrastinate and gamble that the Oligarchs and Congress will benignly reform themselves; but history predicts this is a futile hope – entrenched international Oligarchy and more dictatorships are likely. By trying the Initiatives solution for a few years, with the built-in ability of the People to adjust, improve, or abort the solution, at a total cost less than building one big warship, the U.S. will regain its democratic republic and world leadership in democracy. By ignoring it, the People will have only themselves to blame as they and their children lose their rights, freedoms, and security. There are thousands of U.S. non-profit organizations seeking to resolve a wide range of valid political and national problems with little hope of success; if enough were to adopt Citizens Initiatives in a unified front they would all vastly increase their chances of individual and collective success. How Will the People Propose, Select, and Approve Initiatives? What Is the First Draft Wording of the Initiatives Amendment? How Will States Demand the Initiatives Amendment? How Will the Initiatives Amendment System be Physically Implemented? What Type of Issues Might Initiatives be Able to Solve that Congress Cannot?